Dr. Richard O. Noblet is originally from Florida. He received his Doctor of Dental Surgery degree from Emory University School of Dentistry in Atlanta, Georgia, where he met his wife, Mellie. After graduating from dental school, he completed a general dentistry rotation residency at the U.S. Public Health Hospital in Boston, Massachusetts, and then served in the U.S. Public Health Service for two years in our community. Mobile has been home for his family for over 35 years. Being active in our community is important to him, and he supports many charitable organizations. He is on the administrative board and is an active member of Ashland Place United Methodist Church. He has been on the board of directors of the Child Advocacy Center for many years and is actively involved with their fundraisers during the year. He is also a member Rotary International. Dr. Noblet enjoys playing tennis, fishing, and traveling near or far. He is a graduate of the Foundation for Advanced Continuing Education, a member of the American Dental Association, Alabama Dental Association, Fellow in the Academy of General Dentistry, and he is a member and former president of the Mobile Area Dental Society. He is a Fellow of the International College of Dentistry. Fellowship in the College is extended by invitation after peer review and recognition of the dentist’s “outstanding professional achievement, meritorious service and dedication to the continued progress of dentistry for the benefit of humankind.” He is happy to have his son, Chad, as a partner in Noblet Family Dental. Dr. Charles Noblet is a second generation dentist and native of Mobile,AL. He and his wife, Dr.Ashley Wasserman, are excited to be back in Mobile. Dr. Noblet received his Doctorate of Dental Medicine degree from the University of Alabama at Birmingham and completed a hospital dental residency specializing in the management of medically compromised patients at Kingsbrook Hospital in Brooklyn, NY. 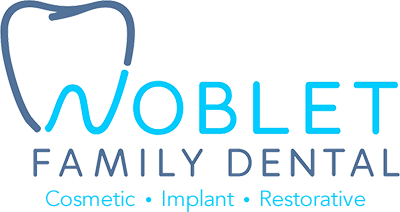 Dr.Noblet’s emphasis on patient comfort and on listening to patients’ concerns allows him to develop a customized treatment approach to address your specific dental needs. Dr. Noblet’s commitment to continuing education exposes him to the latest philosophies in all phases of general dentistry which allows him to provide the best quality care. He is a graduate of the Dawson Academy for Cosmetic and Anterior Esthetic Smile Design and Functional Occlusion. He is a member of the American Dental Association, American Academy of General Dentistry, International Dental Implant Association, Alabama Dental Association, and Mobile Area Dental Society. During his free time, Dr. Noblet and his wife enjoy being outdoors and on the water with their two rescue dogs Zorro and Reese. He is an avid music fan and enjoys going to concerts, playing any instrument with strings and collecting vinyl records. He and his wife enjoy international travel and sampling the local culture and cuisine, and he loves to get restaurant recommendations from his patients! Dr. Ashley Wasserman is excited to join her husband and father in law in the family practice. She is honored to continue the tradition of caring for the patients that have been entrusting their oral health to the practice for multiple generations. She completed her undergraduate degree at Auburn University and Columbia University. Dr. Wasserman received her Doctorate of Dental Medicine degree from the University of Alabama at Birmingham and completed a hospital dental residency at Maimonides Medical Center in Brooklyn, NY. Dr. Wasserman’s focus is on providing compassionate care and working with her patients to achieve and maintain healthy smiles for life. Dr. Wasserman is a member of the American Dental Association, Academy of General Dentistry, and Mobile Dental Society. During her free time she and Dr. Charles Noblet love to spend time on the water or at Springhill College with their two rescue dogs, Zorro and Reese. She loves to travel especially abroad and always enjoys talking about new places to visit with patients. She spent a summer studying in Salamanca, Spain and is proficient in Spanish. She not only loves designing smiles but enjoys interior design and architecture.